©Bert Gildart: Prior to the settlement of the West in the 1800s, an estimated 60 million bison roamed North America, but by 1902 only about 700 remained. 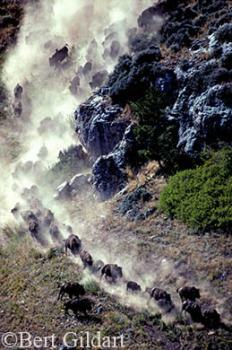 Of that total, 23 were in Yellowstone National Park; the others were mostly in private herds. One-hundred years ago, about the time bison numbers hit rock bottom, the National Bison Range was created, and that is an event that is being celebrated TODAY, May 5, 2008, at headquarters near Moiese, Montana. Truly there is much to celebrate, as the herd at the range now numbers about 350 animals, large enough to cull animals annually and make them available to other wildlife management agencies, such as the Crow Reservation near Hardin Montana. The photo shown here is, in fact, of the Crow Indian roundup, conducted each year, and which I once covered. Animals from the National Bison Range have also been shipped to an area Janie and I once drove past in Alaska. Now called the Delta Junction Bison Range, managers believe the shipment provides anecdotal information about the status of the Montana herd. Because the population of bison was once so low, genetic diversity was greatly reduced, and the result is that when animals were shipped to Alaska, the gene for albinism was apparently removed from the Montana herd. As a result, the National Bison Range’s most famous bison, an albino buffalo known as Big Medicine, has never since been replicated at Moiese. Big Medicine was born in 1923 and lived for 23 years. WHO SHOULD MANAGE THE REFUGE? Today, though there is much to celebrate, there is an ongoing controversy at the range, and at the heart of the heated debate is who is best suited to manage the refuge: tribal members from the contiguous Salish Kootenai Tribe or professionals from the National Bison Range? Natives say they have a spiritual association with bison while managers say they have been educated in the science of wildlife management and that success should speak for itself. Just how this battle will play out is anyone’s guess, but some say this several-year-old fight (and it has been a fight!) may be resolved in the next few months. Over the years I’ve written much for various travel publications about the refuge and posted several blogs about it. More background about the contentious problems is provided as well as some information with many photos on just what you may expect to discover from a visit. The bison range is open seven days a week and includes an incredible drive that not only provides the opportunity to see bison, but to see deer, elk, antelope and bighorn sheep. 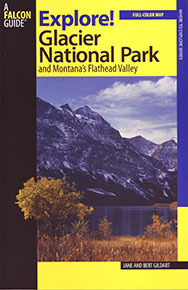 You can also learn more about the Bison Range from our book on Exploring Glacier and the Flathead Valley, shown here to left. The book can be purchased by e-mailing us, or by contacting Falcon Press. This entry was posted on Friday, May 23rd, 2008 at 8:08 am and is filed under National Lands, Photography. You can follow any responses to this entry through the RSS 2.0 feed. You can leave a response, or trackback from your own site. Correction: Big Medicine was not a true albino, having blue eyes, brown horns and feet and a light brown topknot. He was born in 1933, not 1923, and died in 1959 at the age of 26. I saw him just before his death when I was eight years old. He was mounted and can be seen at the Montana Historical Museum in Helena.